Tom: Your case is interesting. Hopeless, but interesting. Desmond: You really think it's hopeless? Tom: It's what I used to call a "real St. Jude." Tom: Because St. Jude is the patron saint of hopeless cases. Michael: As I recall, sir, you've won quite a few St. Judes in your time. Evelyn is a classic inspirational drama, a story so familiar and shop-worn, we don't really even need to be told that it's based on a true story. All the hallmarks of the form are there: a cast of big name actors, a well respected director, an overpowering musical score, and a classic David and Goliath narrative. Desmond Doyle (Pierce Brosnan, Scottish accent intact) is a loving husband and father living in Ireland in the 1950s. A painter and carpenter, he's well-meaning, but a bit of a drunk. When his wife runs out on her family, he finds it difficult to care for his two sons and his daughter Evelyn (Sophie Vavasseur). At the time when the Catholic Church and the Irish government went hand in hand, it was considered inappropriate for a father to raise children alone unless the mother had died, and soon enough, the authorities get involved and make the decision to "send in the nuns." Desmond's boys are sent to a boarding school, and little Evelyn is put into the care of the nuns at a church orphanage. The story is front and center here, and director Bruce Beresford (Driving Miss Daisy) films in a low-key, straightforward manner that services the classic narrative arc. We follow two congruent plots, as Doyle tries to get his life back in order and win back his children, and Evelyn deals with the nuns (there seem to be only two, Sister Felicity (Karen Ardiff), kind and loving, and Sister Bridget (Andrea Irvine), abusive and cruel. The outcome of either story is never in doubt, but both play out in a most satisfying, occasionally sappy fashion. The real life case of Desmond Doyle was a landmark in Irish history because it was the first to challenge a law as unconstitutional. The filmed version trumps up the importance somewhat, suggesting that it allowed all the orphans to return to their families (a girl near the end shouts "Evelyn's won; we can all go home soon! "), but it earns points for sentiment. The briskly placed screenplay seems rather short, and time seems awfully compressed, though the story is simple enough that a lot of dramatic padding isn't really necessary, though there is a love interest for Desmond, a barmaid (Julianna Margulies) who introduces him to her brother Michael (Stephen Rea), an attorney, and Irish-American lawyer Nick (Aidan Quinn), who help him win his case. The big name cast performs admirably, and Brosnan is particularly likeable in a decidedly non-Bond role (he even gets to sing a bit). Sophie Vavasseur is adorable and believable, even if she does get a bit cutesy at times. The script is certainly guilty of the same; there is a running motif about "angel rays," sunbeams that let you know your guardian angel is watching over you, that plays a large part in the climactic courtroom scene (and even warrants a song over a joyful closing montage). It's not a film for cynics, but it's a solid, well made film with character. Image Transfer Review: This is a nice looking transfer of a film shot in a very simple, classical style. Colors are very warm and a bit subdued, though they always appear natural. Black level and shadow detail are both quite acceptable, though some interior scenes appear to be a bit too dark. I didn't notice any artifacts or edge enhancement, though I did spot a touch of aliasing on hard surfaces in one or two scenes. Source materials show no print damage or obtrusive grain. Audio Transfer Review: This is a fair 5.1 track. Most everything is confined to the front soundstage, but Evelyn isn't the type of film that demands an immersing mix. Dialogue is clear and anchored in the center channel, while the front mains handle the majority of the sound effects with very good directionality and stereo separation. The surrounds do occasionally support the score or provide ambient sounds, and in the courtroom scenes near the end of the film they lend the dialogue an echo-y quality that sounds a bit unnatural (it's supposed to illustrate how large the courtroom is, I suppose, but it comes and goes). Extras Review: Evelyn includes a number of bonus features, and though all are a bit routine, they'll likely please fans of the film. First up are two full-length commentary tracks. The first, with director Bruce Beresford, is a fairly reserved affair, a typical mix of technical comments and anecdotes about the development process. The second features actor Pierce Brosnan and co-producer Beau St. Clair. Both discuss how they became involved with the film, heap lavish praise upon all involved, and generally have a good time reminiscing. It's the more entertaining of the two, but both tracks are a little on the dry side. Also slow going are the two featurettes, both of which focus on much the same subject matter (I suspect they were split apart for legal reasons having to do with actor royalties). The first, The Story Behind the Story (19 minutes) reveals how writer Paul Pender got involved with the Desmond Doyle story and how Pierce Brosnan and Beau St. Clair secured Beresford as a director and worked to fund the picture through Brosnan's production company. I assumed from the title that this piece would focus on the real Desmond Doyle, but he's given little more than a cursory mention. The same largely holds true of Behind the Scenes (21 minutes), though Brosnan and the cast do talk a bit at the beginning about how Doyle inspired them. Otherwise, this is a fairly standard interview piece (though it's happily free of promotional fluff), as the writer, director, and cast all discuss how they got involved with the film and how they all worked on a short schedule and a low budget to bring together a film they all believed in. Aside from a photo gallery, the rest of the extras are promotional in nature: the theatrical trailer, a soundtrack spot, and trailers for the MGM special edition DVD releases of Thelma and Louise and The Princess Bride. 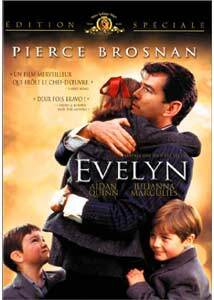 Evelyn follows a familiar pattern for inspirational "based on a true story" films, but it is well acted, and fairly well written and directed, right down to the requisite tearjerker ending. MGM's DVD offers a fine presentation and is well worth a rental.